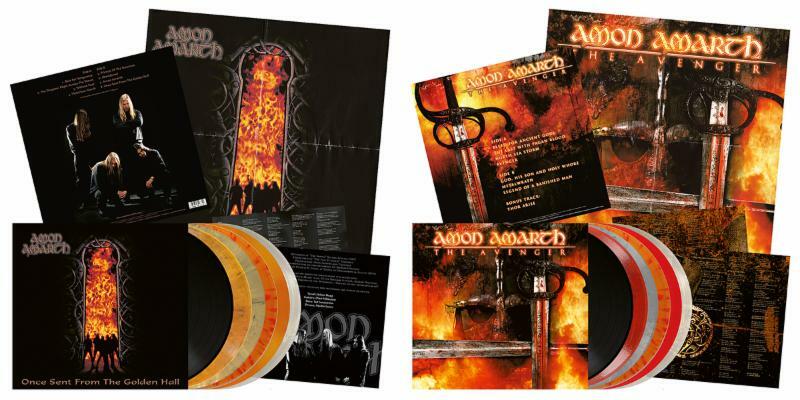 Amon Amarth has re-issued two of its classic albums. The veteran Swedish metal outfit has re-issued its 1998 sophomore album Once Sent From The Golden Hall and its follow-up, 1999’s The Avenger. Both albums have been made available on special separate European and American vinyl packages. The American vinyl re-issue of Once Sent From the Golden Hall is pressed on 180-gram vinyl and is presented on Orange, transparent, and “Fire-splattered” pressing. The orange and transparent pressings are limited to only 200 copies each. The “Fire-splattered” pressing is limited to only 300 copies. The album’s orange pressing is available as a Metal Blade USA exclusive while the transparent pressing is available via mail order and retail exclusive. The “Fire-splattered” pressing is available exclusively through Euro ebay and Metal Blade USA. The Avenger is available on 180-gram black, red, transparent and “Fire-splattered” pressing. The red pressing is limited to only 200 copies and is available exclusively via Metal Blade USA while the transparent pressing is limited available via retail/mail order and is also limited to only 200 copies. The album’s “Fire-splattered” pressing is limited to just 300 copies and is available via Euro ebay and Metal Blade USA. The full details on each album’s U.S. re-issue is noted below. The details for the albums’ European vinyl re-issues is slightly different from their domestic re-issues. Once Sent From The Golden Hall will be available in Europe on separate 180-gram black, Opaque-Orange-marbled, Khaki-marbled, and “Fire-splattered” pressings. The Avenger will be available in Europe on separate 180-gram black, Opaque-blood red-marbled vinyl, steel-grey-marbled and “Fire-splattered” pressings. The complete details on availability of each record’s re-issue are noted below. Metal Blade Records officials announced this week the company will re-issue all of the band’s albums chronologically in the near future. A specially designed slipcase-box for the albums is available via EMP. The box fits the band’s complete catalogue. This entry was posted in Celebrities, Internet, Music and tagged Amon Amarth, entertainment, facebook, internet, Metal Blade Records, music, Phils Picks, Twitter, Wordpress by philspicks. Bookmark the permalink.